I am trying to update Citavi to 5.7.1 while Citavi is running and the progress bar keeps freezing without an actual update. 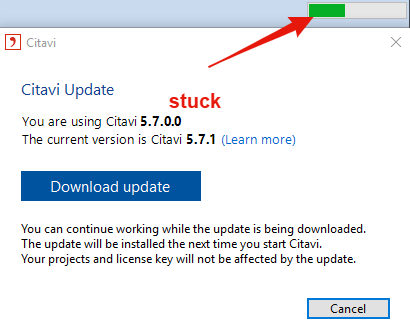 I am trying to download Citavi 5.7.1 for Windows 10 from https://www.citavi.com/en/download.html but it's not downloading. It is giving me a Failed - Network Error. This happened last night and then I gave it a day hoping the issue would work itself out, however, today the same thing is happening. I hope someone can help me figure out what I need to do to update. Also, I see on the forum that the forum site is changing, but I did not see a link to a new forum. I hope posting here is still appropriate. It finally downloaded but it took FOREVER.